Love your CAS cards; thanks! I love the old car with snow on it! Grest card! Great cards, love the car on the craft cardstock. Thanks for a chance to win. Hi Beth! Your cards are clean, simple and fresh! Thanks for the inspiration! I really like how you use Kraft paper for a background. Adds to the old-timey charm! Thanks for sharing. Fantastic inspiration using the new Gina K products! Love your clean designs. Awesome! Just love the antique car w/snow!! Wonderful cards! Love the truck on the craft paper. The puppy card is so cute, and your poster paint snow looks great! Love the car on the Kraft cardstock! And the new puppy card is so sweet! Great stamps and great cards! I especially love the truck on kraft cardstock! Great cards. I like the kraft for the car card. What a GREAT old car card! Love the use of craft paper cards!!!!! I am going to have to try the “poster paint” snow! I love how vibrant it is. Great cards, now I think I need to go shopping! Fun cards. 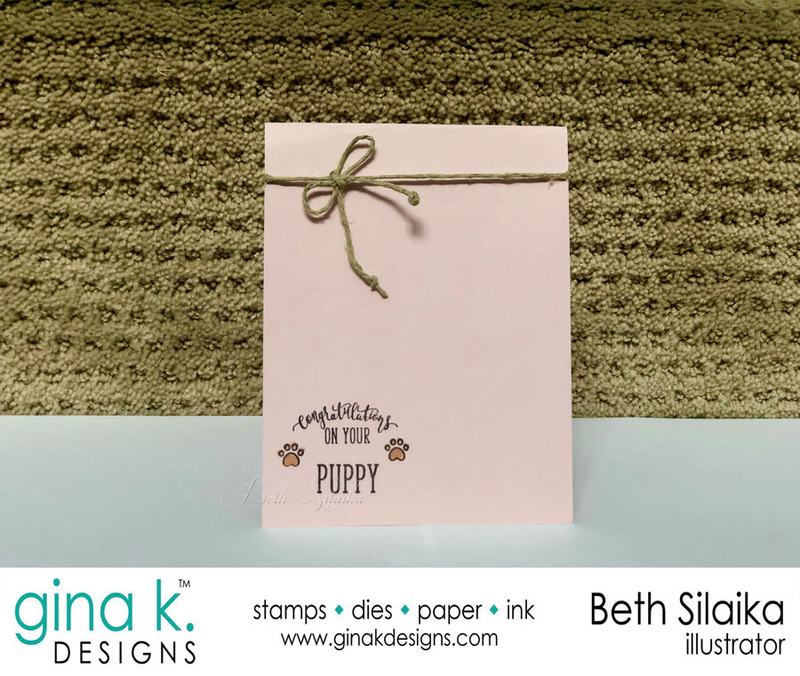 Sweet puppy card and the vintage car is great! Fantastic cards! I love the car! These look great on the kraft paper. The car on kraft is a great choice. I like the simplicity of the pink one gives it a sweetness I really like. I’m in love with the Old Time Christmas set. Just love the car and the flowers are gorgeous. Thank you for the opportunity to win. I like clean and simple cards. Thanks for the lovely inspiration. Neat comment about the rope reminding you of a chew toy. I love the vintage feel of the truck! Great card – great stamps! 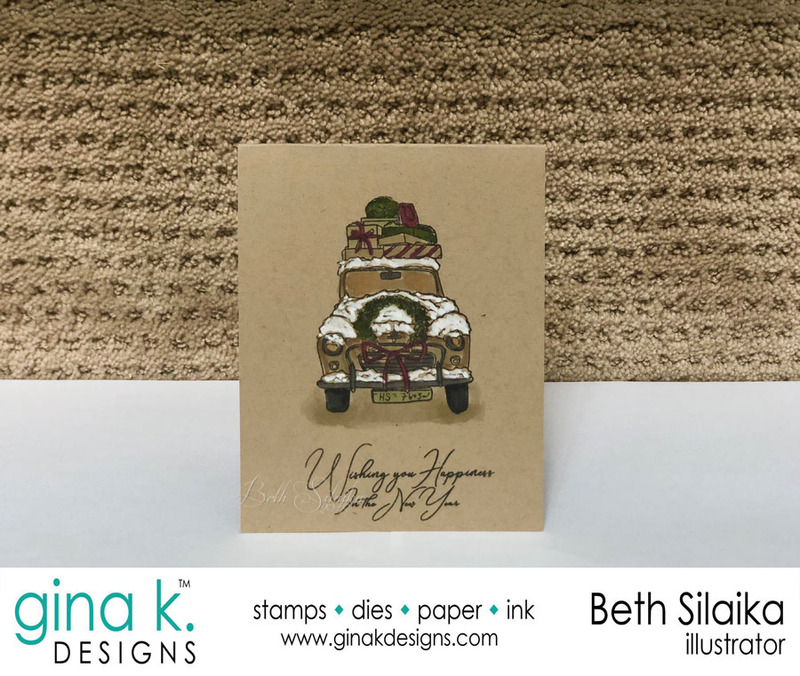 Beth, love your cards, I especially love the old car in the Kraft paper! Beautiful cards!!! Love so much the first one!!! I love the CAS look! And the snow! Wonderful card designs and these are great stamp sets. I love the truck done in the kraft color because it adds to the feeling of old fashioned and homespun. The limited additional color is simple yet has that Christmas look and feel. The snow adds that touch that lets you know what season it is. Wonderful cards and inspiration! love that truck! These cards are really special! Amazing creations! that pick up is great! Love your cards. The poster paint worked great! Awesome cards! Love that cute truck! Love the vintage charm of the old model car and the simple elegance of the puppy card. Thanks for sharing this inspiration with these fun products. Next Next post: A new FreckledAndFun Blog Location!